Another offer for clients from one of our funding partners. If you are looking for bad debt protection (also known as non recourse), you will pay what is called the CPE or Credit Protection Element of your service charge for the bad debt protection. Under the terms of this promotion, our partner is offering to refund the first 6 months CPE charge to new clients, in return for them entering into a 18 month agreement, with 6 months notice of termination. 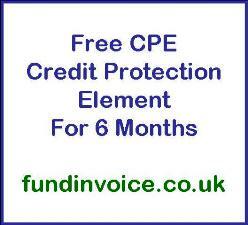 So effectively, you will get 6 months bad debt protection for free (refunded retrospectively). You must have a formal offer from them by 30th April 2017. To qualify you must take out a new invoice finance facility with them, and have a maximum debtor concentration of 40%. This offer does not apply if you have more than 20% export sales on your ledger. For full details of the terms and conditions, please contact us or call Sean on: 03330 113622 and he will put you in touch with our funding partner. This offer may be withdrawn at anytime, and our partner may decline to offer to your business at their absolute discretion. Bad debt protection gives you peace of mind should your customers become insolvent and hence fail to pay you. The provider will credit check your customers for you, undertaking all the reseach on the credit worthiness of new customers. This will save you having to undertake that function yourself. The provider will then set credit limits for each of your customer accounts. Providing your invoices fall within the agreed credit limit, they will be covered and you will have 100% protection against customers becoming insolvent (there may be a first loss clause agreed in respect of any claim). If a customer should become insolvent, the provider will deal with the insolvency practitioner saving you time and hassle and the process could be resolved within as little as 2 weeks.